Any first year art student knows if you want to draw the figure you need to know some anatomy, and if you want to draw the figure well, you need to know anatomy very well. Simply put, when you draw something like a table, what you see is what you get. A box is a box. When you draw the human form what you see on the outside is given its shape by what you do not see underneath on the inside. Hence the need to know anatomy to represent the figure well. 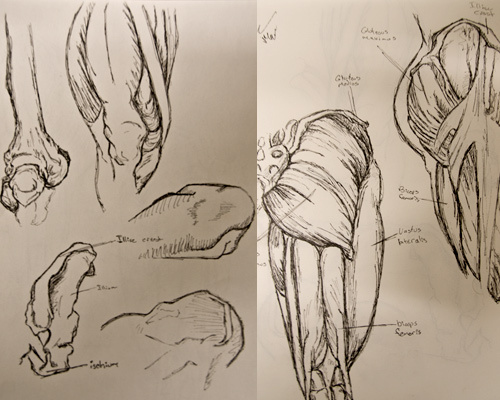 When I was younger I used to sit filling sketch books with sketches of anatomy. I’d fill them tirelessly over and over every chance I had. Waiting for a bus, eating lunch, watching tv. Every chance I got. As I grew older and more interested in things like color, style and other more expressive aspects of art I seem to have fallen out of the practice of doing anatomy sketches. On a related note. I was thinking how in “The old days” many artists would observe cadaver dissections in order to better understand anatomy. This is something I am currently looking into to see if its even possible for artists to do these days. I may be open to doing that. Def need to check out the Bodies exhibit as well. I am continuing down my path of rediscovering pastels. For this drawing I did just about the entire piece in Sennilier extra soft pastels. They are very expensive, especially for a piece this large (51″ x 40″). The colors are amazing, I really don’t think the photograph does it justice but its about the best I could get. I also used Arches 140lb cold press rough water color paper which allowed me to really work the pastels over and over, much like a painting. Its not a perfect piece and there are some area’s that I feel could use improvement but she’s a beaut to look at!